I am aware that since Jehovah’s Witnesses believe there is only room for 144,000 members in the anointed class and therefore expect those claiming to be one of this number to be dwindling as the elderly ones reach the end of their lives. I was curious how much the numbers of memorial partakers has been declining, so I looked up the Grand Totals from the last 10 years, and a couple of random previous years, the earliest being 1975. I did quite a bit of number crunching as I became curious about more and more things. The first thing I found out is the number of partakers has gone up every year since 2000. Last year alone it went up by 2836 people. Its up 9163 people since 1991! 9163 is 6.36% of 144,000. This number was added to the total of the “annointed class” in the last 25 years alone. (I once read the book of Acts and payed attention to how many people were added to the number of believers. Some actual numbers were given and some vague numbers like “great multitude” or “all of Lystra.” I tallied up all of these numbers giving purposely low-ball guesses to the vague descriptions and concluded that at the very least and probably an extremely low estimation of how many were saved in the book of acts (the first 30 years after Jesus Died and Rose) was 40,000 people. (It potentially may be several times that number). But 40,000 would be 28% of 144,000). We all know the numbers of believers multiplied more and more quickly the more it spread. Acts 17:6 says the impact of these men has overturned the inhabited earth! So the modest lowball guess of 28% plus the current 18,013 partakers alive today which is about 13%= 41% of the 144000 accounted for in our lifetime (70 years) + the 30 years recorded by the end of Acts. So does it make any sense that at least 41% of the anointed class existed in 100 years time and the rest of them were spread over 1916 years which would leave room for about 44 new anointed converts per year between acts and the time those living today were born? And does it make sense that the numbers are growing still today? Hmmmmm. Then Baptisms caught my eye. This quickly become interesting. In 2016 there were 264,535 JW’s baptized. There were, on average, 8,132,358 preaching publishers. This means there was 1 (ONE!) convert (assuming baptism makes it official) per 31 publishers, averaging 244 preaching hours each. That’s 7564 hours of preaching per 1 new member! Since there were 119,485 congregations worldwide, this would be 2.2 converts per congregation. (In a whole year? And everyone’s preaching? That doesn’t make any sense) especially since we all know that a large percentage of these Baptisms are people who were born into the Org, not the result of the preaching work. (Just for fun I figured it out. The world average annual birth rate is 19 per 1000. Let’s say the average age of born-in JW gets baptized at 16 years old. So, rewind 16 years to the year 2000. The number of births for the number of Jws in the year 2000 was 6,035,564 ➗1000=6035.564✖️19 babies=114,675.715 births. Fast forward to 2016 baptism. The born in JW Baptisms represent about 40% of the total Baptisms. With this considered, the convert rate changes to 1 (non born-in convert) for every 46 publishers.) can you imagine taking 45 of your friends, spreading out across a town, preaching 244 hours each, and between all of you over a whole year, you’ve only gained one person? Hooray for the one convert, but really? Only one? It only took 7 publishers and 1296 hours of preaching to gain 1 convert back then. Evidently people were more effective a few years ago. But even that ratio is way too many people and hours for 1 convert in a year’s time. I encourage you to read the book of Acts carefully…paying attention to how the gospel was preached, where, to how many, and what was the response, and how many were baptized and when? Then ask yourself if the preaching work even remotely compares with its results. Another thing I noticed was in 1991, 211 “countries” were reported. By the way, Google says there are 196 countries in the world. 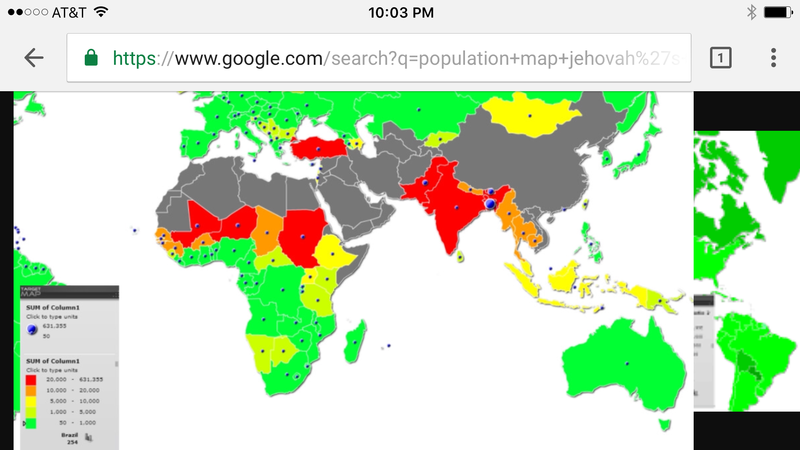 And if you Google population maps of Jehovah’s witnesses, and count the number of countries which have no JW population…you’ll see 25 of them (if I counted right). So they started calling them “lands” which is fine. People can be divided into smaller places based on other factors. However, this makes it hard to know exactly how much progress is being made (or not made). And it camouflages the fact that they hardly have even gone into 25 countries in the 10/40 window (the dangerous areas of the world) at all (At least according to the map). I read an article a while back about how Jws are not sent to dangerous lands. What? Why not? Haven’t Christians died for their faith since the beginning? I’ve known Christians who have gone as missionaries into the face of death on purpose for the gospel of Christ from as early as I can remember. Jws are not in the countries that need truth the most. Previous Post Is Scripture Sufficient? Next Post Are You a Confirmed Drunkard? I just recently watched the movie Molokai, which is about the Jesuit priest who went to the leper colony on that island, knowing that it would be a death sentence for him. Whether he was a born again priest, I don’t know, but you have to be impressed with his sacrificial servanthood. Anyway, your post is impressive, not only for the math skills involved, but the logic as well. May God’s Holy Spirit use it to draw our JW friends to Jesus.